Every single card in a Tarot deck is associated with a particular number. From the High Priestess to the Tower to the World Card, they all have a numerological equivalent. Most of the time, especially in the major arcana, these numbers are actually written on the cards themselves. Life Path 2 – The High Priestess… Keep on reading! 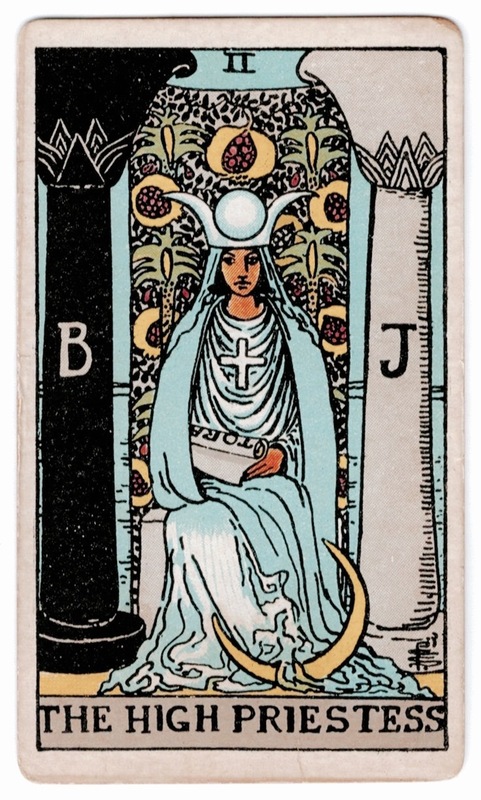 The High Priestess is the psychic of the tarot. Sitting coolly in front of a long, hanging curtain, she is veiled from passers-by and sits as the guardian of mystical realms. The curtain is adorned with images of pomegranates, a fruit sacred to the Greek Goddess Persephone. In her mythology, she was taken into the Underworld by Hades and whilst there, her mother Demeter mourned her so terribly that all of life shrivelled and died. The rule of Fates dictated that anyone who consumed food in the land of shadow must stay there, and whilst with Hades, Persephone ate 6 pomegranate seeds. But a deal was struck and it was agreed that Persephone could spend 6 months of the year in the upper world and six months in the underworld. In this way, her mother was appeased and nature brought back into balance as the seasons were created. This myth is represented through the High Priestess Card, and we are reminded of her ability to move between the worlds. What lies behind The High Priestess’ veil? A vast, calm ocean. The element of water represents intuition and pure feeling. 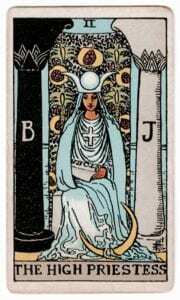 It is also intricately tied to the crescent Moon which sits at her feet, and her feminine mysteries. She holds an ancient scroll of the Torah in her arms, symbolizing hidden and esoteric wisdom. The High Priestess is master of these realms. As a spiritualist and a teacher, ask her very nicely and she might let you through so you can bathe in that ocean. The High Priestess is a person who knows how to tap into higher powers to get beneath the surface of what’s really going on. An expert in her own soul’s calling, she is also able to tune into the frequency and energy of others – something people can find wildly attractive… or just plain spooky. She’ll listen to what you have to say, pause for an awkwardly-long silence, and then get to the heart of what’s really going on, as if by magic. ⇢ You have unusual psychic abilities – perhaps you ‘see’ or ‘hear’ things other people can’t. ⇢ You often find you know people better than they seem to know themselves. ⇢ Quiet and thoughtful, you don’t waste words. ⇢ You have a great sense of self-understanding, and the skill and willingness to continually delve deeper. ⇢ You may not have a huge social circle, but the hand-picked friends you have, you know well and love dearly. These are similar to the traits which are emphasised in a Tarot reading when the High Priestess Card shows up reversed. ⇢ People often interpret you as aloof or impenetrable and you do have a tendency to seem like you ‘know it all’. ⇢ You may find it hard to let people get close to you. ⇢ You might have trouble lightening up from time to time. Not everything has to be about deep meaning – remember to relax and enjoy life’s simpler pleasures sometimes! ⇢ You have a tendency to overwhelm people with your complicated ideas. Try to bring things back to the realm of the real to avoid being confusing! ⇢ You and a Heirophant (Life Path 5) would make an impressive, indomitable team as two deeply intelligent spiritual ‘teachers’. ⇢ A Hermit (Life Path 9) would complement your ‘inward looking’ energy, though if you two got together, your friends needn’t expect to see much of you and this could be a decidedly anti-social relationship! ⇢ You’d probably clash with an Emperor (Life Path 4), who doesn’t have time for your ‘deep thoughts’. ⇢ The Empress‘ (Life Path 3) focus on the material and the sensual might be off-putting to you. On the other hand perhaps she’ll bring you down to earth and cook you a fabulous meal to stir up your senses. If you’re shy in bed she’d show you a thing or two with love and understanding. ⇢ Your interest in the subconscious would make you a great counsellor or psychotherapist. You enjoy listening to other people and getting to the root of what they’re saying. Taking this further, you could develop your psychic abilities and be a spiritualist, medium, tarot reader or another esoteric practitioner. ⇢ You would also make a great spiritual teacher. You’ve spent a long time learning about the mysteries of the unconscious and have much to share with others. People see you as an authority on their own inner needs and come to you for help – you have the skills to show them how to journey like you have and find their own truths. ⇢ As an artist, you’re dark, deep and often difficult to understand. You wow them with your mystery!